While in search of a dining table since the one from another online store sold out I stumble on to the Overstock website. I fell in love with this set. I’m glad it happened because I love this one so much more. I searched other online stores for better prices and NO one could beat Overstock! Great quality piece of furniture at a great reasonable price. 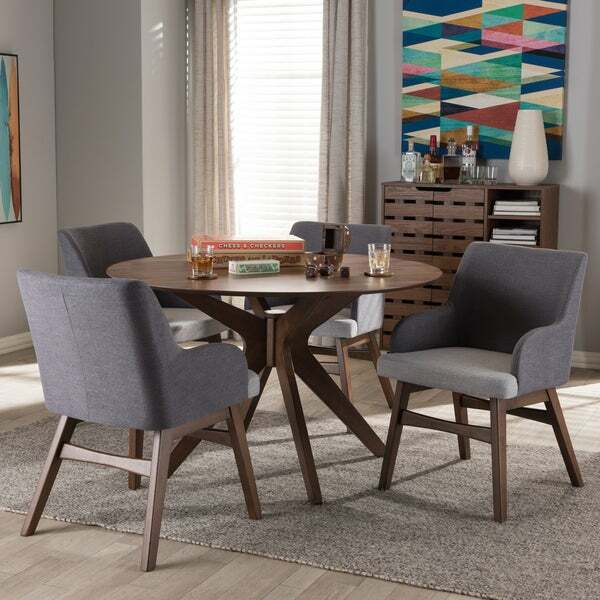 Showcase elegant contemporary design in your dining room with the comfortable 5-piece dining set, consisting of a round dining table with four dining armchairs in the set. Constructed of solid rubberwood frame, the dining set offers a strong and sturdy structure for your dining room. Upholstered in two-tone dark grey and light grey polyester fabric, the dining armchairs provides exceptional softness and durability for long hours seating purpose. Walnut finished wood legs form reliable structure with lasting good looks in the natural wood styling. Padded with foam for lasting comfort for enjoying everyday family dinners, the dining chairs feature tall seat back for added support and raised armrests for hugging comfort. Timeless grey hue to complement your existing palette, the dining set features minimalist design for contemporary style to last years in your home. Made in Malaysia, the set requires assembly. I actually bought this dining group to use as a conference table in my office. It fit perfectly in the space and look fantastic with the decor. The chairs are comfortable and sturdy. Very easy to assemble. It matches the decor of my home. I like Mid-century furniture. "How do I clean the table ? Is regular furniture polish okay??" We recommend wiping clean with a damp cloth, then immediately drying with a dry cloth. We do not recommend polish or abrasive cleaners.